The Horror of Frankenstein is a 1970 British horror film by Hammer Film Productions that is both a semi-parody and remake of the 1957 film The Curse of Frankenstein. 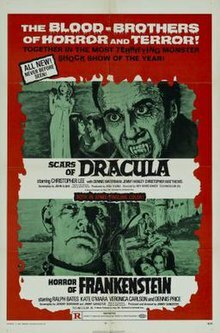 It was produced and directed by Jimmy Sangster, starring Ralph Bates, Kate O'Mara, Veronica Carlson and David Prowse as the monster. The original music score was composed by Malcolm Williamson. Victor Frankenstein, a cold, arrogant and womanizing genius, is angry when his father forbids him to continue his anatomy experiments. He ruthlessly murders his father by sabotaging the old man's shotgun, consequently inheriting the title of Baron von Frankenstein and the family fortune. He uses the money to enter medical school in Vienna, but is forced to return home when he impregnates the daughter of the Dean. Returning to his own castle, he sets up a laboratory and starts a series of experiments involving the revival of the dead. He eventually builds a composite body from human parts, which he then brings to life. The creature goes on a homicidal rampage until it is accidentally destroyed when a vat where it has been hidden is flooded with acid. The film was entirely financed by EMI. Ralph Bates was cast as Victor Frankenstein, the role having, five times previously, been played by Peter Cushing. Soon afterwards, he did a take on Dr. Jekyll in the Hammer film Dr. Jekyll and Sister Hyde (1971), which co-starred Martine Beswick. In the mid-1960s, David Prowse, later famous for his portrayal of Darth Vader in the first Star Wars trilogy, had actually gone into the Hammer offices to express his desire to portray one of their movie monsters, but was rather abruptly dismissed. As several years passed by and he went about building a larger body of work through various film roles, he was eventually approached by Jimmy Sangster about being cast as this revisionist Baron Frankenstein's laboratory creation. Prowse has the distinction of being the only actor to have portrayed Frankenstein's monster in more than one Hammer film: this production marked his first such appearance; the second occasion was Frankenstein and the Monster from Hell (1974), where his overall appearance was much more horrifically elaborate. He also appeared briefly in the traditional Frankenstein's monster make-up and costume in a gag appearance in Casino Royale (1967). Howard Thompson of The New York Times enjoyed the first hour as "not only painless but also fun," comparing it favorably to Kind Hearts and Coronets. He disliked the final act when the monster emerged, "with awkward horror pitted against rather bland sheepishness. But it was good fun while it lasted. Hammer almost had something special." Variety wrote that the film "has an occasional lighthearted touch which adds much to its enjoyment," praising Bates for a "nicely suave and sardonic performance as the ingenious, self-assured son of Count Frankenstein." Kevin Thomas of the Los Angeles Times called it "a talky affair" and lamented that the new Frankenstein was a less sympathetic character than the one Peter Cushing played, as well as the monster being "simply a robot killer." The Monthly Film Bulletin declared: "This awkward and inordinately tedious attempt by Hammer to ring changes on the Frankenstein motif is liable to have even those who disliked the old formula wishing it had not been messed about. Jimmy Sangster may have supposed that in turning the Baron into a sexually voracious anti-hero with a macabre sense of humour he was bringing him into line with the Seventies, but in fact he only succeeds in annihilating all the power of the original myth and putting nothing in its place." The film has a rating of 56% on Rotten Tomatoes based on 9 reviews, with an average score of 5.4 out of 10. ^ In 1986, Turner purchased pre-May 1986 MGM films, including The Horror of Frankenstein for UK release, now owned by Warner Bros. through Turner Entertainment only in UK. ^ Thompson, Howard (18 June 1971). "Screen: A Horror Bill From Britain". The New York Times: 29. ^ "The Horror of Frankenstein". Variety: 22. 21 October 1970. ^ Thomas, Kevin (3 December 1971). "Count, Baron Go Downhill". Los Angeles Times. Part IV, p. 23. ^ "The Horror of Frankenstein". The Monthly Film Bulletin. 37 (442): 227. November 1970. ^ "The Horror of Frankenstein". Rotten Tomatoes. Retrieved 31 October 2018.